The New Zealand orange roughy fishery is a well managed and sustainable fishery in accordance with the Marine Stewardship Council's Principles and Criteria for Sustainable Fishing. Orange roughy are widely distributed throughout New Zealand and harvested from depths of around 700 m to 1,200 m. Orange roughy are slow growing and may live for more than 80 years. New Zealand has the largest and longest standing orange roughy fishery in the world. It operates in four main areas: off New Zealand’s northern North Island (ORH 1), Cape Runaway to Banks Peninsula (ORH 2A, 2B & 3A), Chatham Rise (ORH 3B) and the Challenger Plateau (ORH 7A). Orange roughy fishing in New Zealand takes place over areas of flat seabed on the continental slope and on seamounts, knolls and hills. Orange roughy is managed by the Ministry for Primary Industries using the Quota Management System (QMS). The Ministry works in partnership with Deepwater Group (a not for profit organisation that works on behalf of fisheries quota owners). The two parties have developed a single joint-management framework with agreed strategic and operational priorities and workplans. The partnership is focused on determining the maximum economic yield of the deepwater fisheries by setting catch limits that maximise returns over the long-term within the constraints of ecological sustainability. The MSC Certification covers orange roughy harvested from management areas ORH 3B, NWCR, ORH 3B ESCR and ORH 7A. The certification covers about 2/3 of all orange roughy caught in New Zealand. The next assessment is scheduled for late 2017. For more information, download the full MSC Certification Report. The MSC scheme follows international benchmarks to promote robust processes and uphold values of independence, transparency, impartiality and stakeholder consultation. The MSC assessment process is run by an independent certification body (accredited by Accreditation Services International GmbH). A group of auditors (with expertise in the fishery and ecosystems under consideration) are responsible for scoring the performance of the fishery based on scientific evidence. Auditors must meet the qualifications and competencies set out in the MSC Certification Requirements. 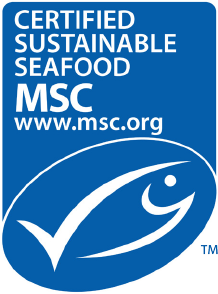 In order to achieve MSC certification, a fishery must pass 28 performance indicators within three core principles: sustainable stocks, minimising environmental impact and effective management. The certification process takes between 6 and 18 months. The assessment process includes opportunities for stakeholder input and peer review. Certification lasts up to 5 years, during which time the fishery makes any improvements required as a condition of certification. Annual audits are carried out by the certifier to ensure continued compliance. A full reassessment of the fishery must be completed within five years of the last certificate being granted. Principle 1 states a fishery must be conducted in a manner that does not lead to over-fishing or depletion of the exploited populations and, for those populations that are depleted, the fishery must be conducted in a manner that demonstrably leads to their recovery. The MSC assessment stated the fishery is exceptionally well managed and is characterized by state of the art stock assessments and harvest strategies. In previous years, all three orange roughy stocks had dropped well below the current target range of 30-50% of unfished biomass but have increased in abundance since the 1990s or 2000s. The stocks of NWCR and ORH 7A are in good condition and within the target range. The stock of ESCR has increased to the bottom of the target range. The information needed to assess stock status relative to the limit reference points and the management target range, and to apply the harvest control rule is an estimate of fishing mortality rate (that, if applied constantly, would result in maximum sustainable yield), an estimate of current fishing mortality, an estimate of recent abundance, current biomass, and an estimate of the unfished biomass. For orange roughy, this information is obtained from quantitative stock assessments based on fitting population dynamics models to monitoring data. Assessments of orange roughy stocks based on fitting population dynamics models have been conducted for many years. However, it has proved challenging to conduct assessments that are not subject to considerable uncertainty for a variety of reasons. In 2014, stock assessments based on fitting population dynamics models were approved for the first time in many years by the Deepwater Fisheries Assessment Working Group (DFAWG), which consists of scientists from the National Institute of Water and Atmospheric Research (NIWA), the Ministry for Primary Industries, representatives of environmental NGOs, and industry. The Ministry for Primary Industries and Deepwater Group continue to contract a range of science and monitoring programmes to routinely assess the status of orange roughy stocks and to monitor the orange roughy fisheries. Orange roughy quota owners pay the full cost for the majority of science and monitoring on these fisheries, either through a Government cost recovery levy or through direct payment through Deepwater Group. Principle 2 states that fishing operations should allow for the maintenance of the structure, productivity, function and diversity of the ecosystem (including habitat and associated dependent and ecologically related species) on which the fishery depends. The assessment stated New Zealand implements high levels of control over the fisheries to minimise environmental impacts. The fisheries have a high degree of certainty to be within limits of national and international requirements for all endangered, threatened and protected (ETP) elements. However, the fishery occurs in regions with deepwater corals and there remains some uncertainty about risk of serious or irreversible harm to ETP coral species in particular areas. The quantity and species of ETP coral incidentally caught in the three orange roughy UoAs differs substantially by area. National legislation does not set numerical limits on coral interactions, but does require minimizing impacts; the orange roughy fisheries tend to fish in previously fished areas on underwater topographic features (UTFs), which minimises new damage. 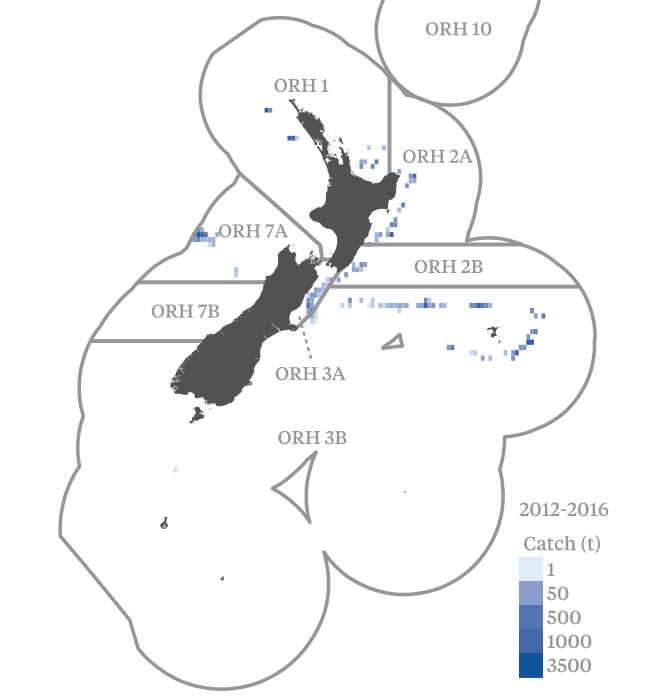 An assessment has been undertaken of the orange roughy trawl footprint in relation to protected coral species distribution in New Zealand waters in which observed and predicted distributions of protected corals were overlain on the orange roughy trawl footprint. Three percent of the known UTF habitat in the EEZ is estimated to have been trawled. 16% of the available UTF habitat area within the three units of assessment are trawled. For each UTF that has been fished, on average, 51% of the area has been trawled. Orange roughy fishing vessels in the three orange roughy units of assessment catch relatively few seabirds and no marine mammal captures have been recorded in the ten year period from 2002 to 2012. All orange roughy fishing vessels >28 m are required to comply with regulations that ban the use of net sonde cables and require the deployment of devices to keep birds away from the fishing gear. Industry standards, supported by the Ministry for Primary Industries, require all orange roughy vessels to agree to a Vessel Management Plan that specifies the management of the disposal of fish waste to minimise it as an attractant to seabirds. Retained bycatch largely consists of species managed within the Quota Management System. Non-retained bycatch account for only a small proportion of the total catch from the orange roughy target fisheries. Principle 3 requires that a fishery is subject to an effective management system that respects local, national and international laws and standards and incorporates institutional and operational frameworks that require use of the resource to be responsible and sustainable. The overarching legislation and regulation affecting Principle 1 and Principle 2 are highly developed, and applied specifically to the orange roughy fisheries. The management system for orange roughy has an effective monitoring, control and surveillance system, including satellite vessel monitoring systems, government observers, and accurate reporting and record keeping. Sanctions to deal with non-compliance in the fishery exist, and are consistently applied. However, the preferred approach is to work collaboratively with industry to prevent non-compliance. The National Fisheries Plan for Deepwater has specific objectives for orange roughy that directly guide actions in the fishery. These are specified in the Annual Operating Plan and progress is reported in the Annual Review Report. Clear long-term objectives that guide decision making, consistent with MSC Principles and Criteria and a precautionary approach, are explicit within and required by management policy. The orange roughy fishery has been managed within the Quota Management System since its inception in 1986. Stock status (ORH 3B ESCR): Provide evidence that the ESCR stock is at or fluctuating around its target reference point. ETP species outcome (ORH 3B NWCR and ORH 3B ESCR): For the ORH 3B NWCR and ORH 3B ESCR, by the end of the certification period, the direct effects of ORH fishing must be highly unlikely to create unacceptable impacts to ETP coral species. ETP species information (ORH 3B NWCR and ORH 3B ESCR): By the end of the certification period information must be sufficient to determine whether the fishery may be a threat to protection and recovery of ETP coral species. Management system review (all areas): By the third annual surveillance the fishery-specific management system must undergo occasional external review.